The Internet of Things is eating the world alive, and we can’t buy incandescent light bulbs anymore. This means the Internet is now in light bulbs, and with that comes some special powers. You can turn lights on and off from a botnet. You can change the colors. This is the idea for the Philips Hue system, which is well respected among people who like putting their lights on the Internet. There are other brands — and you can make your own — but the Hue system does work pretty well. This is what led [Marius] to create software to interface various electronics with the Hue system. It’s a project called diyHue, and already there’s a vibrant community of devs creating their own smart lights and connecting them to the Internet. The software for this project is built in Python, and is designed to run on certain single board computers. This allows the SBC to connect to the Hue bridge so Hue bulbs can be controlled, a MiLight hub so MiLight bulbs can be controlled, or, with the addition of a ZigBee radio, all those ZigBee devices can be controlled. Right now the only thing that doesn’t work is Google Home because it requires a remote API, the Home & Away feature from the Hue app (again, remote API), and the Eneco Toon. There really are a fantastic number of devices this software works with, and if you’re building out your Internet-connected home lighting solution, this is one piece of software you need to check out. Thanks to [cheesemarathon] for bringing our attention to this. He also liked it so much he’s now contributing to the GitHub. Very cool. You have a clean MSDOS system, and you need to write some software for it. What do you do? You could use debug, of course. But there are no labels so while you can get machine code from mnemonics, you’ll still need to figure out the addresses on your own. That wasn’t good enough for [mniip], who created an assembler using mostly batch files. There are a few .COM files and it looks as if the first time you use debug to create those, but there’s also source you can assemble on subsequent builds with the assembler. Why? We aren’t entirely sure. But it is definitely a hack. The technique sort of reminded us of our own universal cross assembler — sort of. Using three old IBM laptop chargers, he’s able to produce up to 48 volts DC at a healthy 4.5 amps. His cobbled together power supply even features an variable output, albeit with some mighty coarse adjustment. As each charger is individually rated for 16V, he can unplug one of the adapters to get 32V. 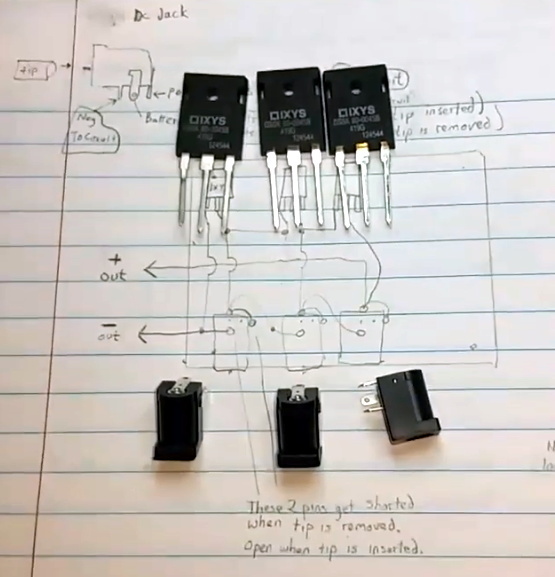 In the video after the break [TheRainHarvester] walks viewers through the construction of his simple adapter, which could easily be made with salvaged parts. Built on a trace-free piece of fiber board, the adapter consists of the three barrel jacks for the chargers and a trio of beefy Schottky diodes. The nature of the barrel jacks (which short a pin once the plug is removed) along with the diodes allows [TheRainHarvester] to combine the output of the three adapters in series without running the risk of damaging them if for example one is left plugged into the adapter but not the wall. He’s also looking to add some status LEDs to show which chargers are powered on. Unfortunately, [TheRainHarvester] realized a bit too late that what he thought was an inert piece of board actually had a ground plane, so he’s going to have to come up with a new way to tie the whole thing together on the next version which he says is coming now that he knows the concept seems workable. In the meantime, if you’re thinking of hacking something together with the wealth of old laptop chargers we know are kicking around the lab, you might want to take a look at our primer for understanding all those hieroglyphs on the back of the thing. 20 years ago, PCB production was expensive and required a multitude of phone calls and emails to a fab with significant minimum order restrictions. Now, it’s cheap and accessible online, which in addition to curtailing the home etching market has created significant new possibilities for home projects. 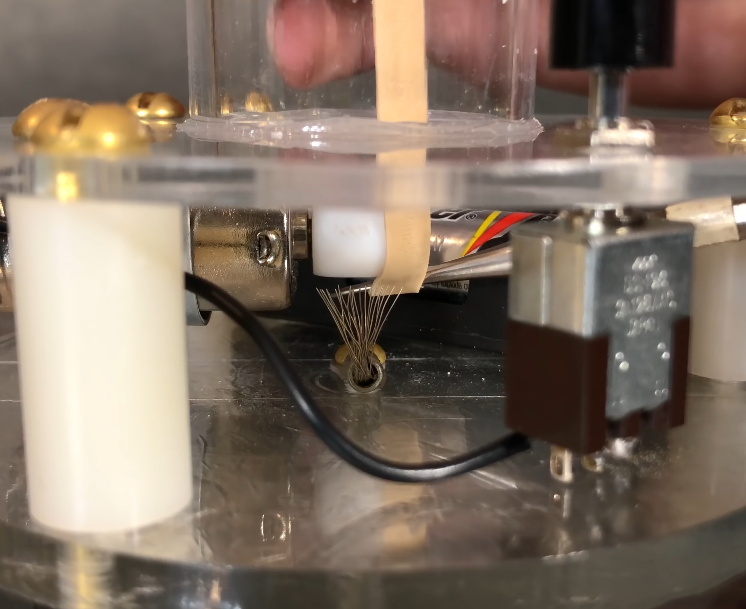 Now that flexible PCBs are also readily available, it’s possible to experiment with some cool concepts – and that’s precisely what [Carl] has been doing. The aim is to build a walking robot that uses actuators made from flexible PCBs. The flexible PCB is printed with a coil, capable of generating a small magnetic field. This then interacts with a strong permanent magnet, causing the flexible PCB to move when energised. Initial attempts with four actuators mounted to a 3D printed frame were unsuccessful, but [Carl] has persevered. With a focus on weight saving, the MK II prototype has shown some promise, gently twitching its way across a desk in testing. Future steps will involve building an untethered version. This will replace the 3D printed chassis with a standard fibreglass PCB acting as both control board and the main chassis to minimise weight, similar to PCB quadcopter designs we’ve seen in the past. We can’t wait to see the next revision, and if you’ve been working on your own walking robots, make sure you let us know.